What do you do if you’re a musician, want to reach out to your fans, but don’t agree with the way things work with Spotify? Well, you’re not alone. Taylor Swift has spoken about this in great detail, and Jay Z has taken matters in his own hands, but creating his own rival to Spotify, called TIDAL. Promising lossless sound quality, this one has huge potential. Today, Sonos has announced that TIDAL is now available to all Sonos users, following its initial beta release in December. Sonos is proud to announce that music service TIDAL is now available to all Sonos users, following its initial beta release in December. 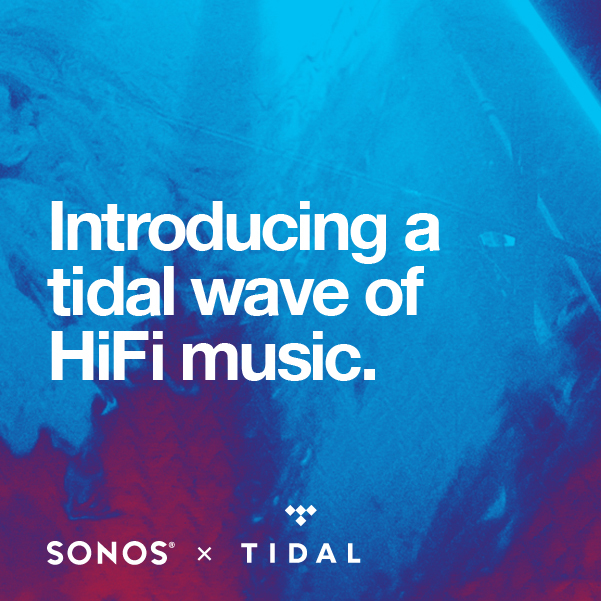 Joining more than 60 music services available on Sonos, TIDAL is the first high fidelity lossless music streaming service with HD music videos and curated editorial content provided by experienced music journalists and industry experts. Music lovers can stream more than 25 million songs in Hi-Fi quality – the way the artists intended – to any room of the home. Monthly subscriptions to TIDAL are available for £19.99 a month and give access to the full catalogue of tracks in lossless sound quality (FLAC/ ALAC 44.1kHz/ 16 bit – 1411 kbps) and 75,000 HD music videos. To access the service on your Sonos system, select TIDAL within the ‘Add Music Services’ menu of the Sonos app. Once logged in, navigation of TIDAL is fully and seamlessly integrated into the Sonos Controller App. For more information visit http://tidal.com/gb.